Cloudcraft is a drawing tool that lets you create dynamic diagrams of your cloud infrastructures. This powerful diagramming solution and visualization tool is intended to help system designers and developers as well as organizations and their teams when it comes to conducting an inventory of all their cloud-based resources and services they are offering to customers and end-users. Moreover, Cloudcraft can generate cloud architecture diagrams in just a matter of minutes. It has built-in components that users can assemble so they can produce actual representations of resources and services from their various cloud infrastructures. The solution can also capture data from cloud environments by enabling users to integrate it with the Amazon cloud services they are opted into. As a result, they will be able to come up with live diagrams that contain rich data, permitting them to gain insights into the status and health of their cloud infrastructure. Infrastructure diagrams created within the solution can be shared with team members so they can collaborate on them and perform editing as needed. 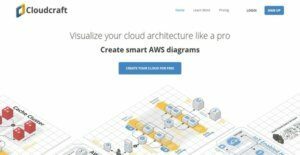 Cloudcraft is a diagramming solution that is exclusively built for managing AWS or Amazon Web Services resources. In fact, it is designed and optimized in such a way that it includes built-in components that represent services, processes, and resources from Amazon Web Services’ suite of cloud-computing platforms; such as EC2, ELB, Lambda, RDS, DynamoDB, Kinesis, Redshift, CloudFront, Route 53, and more. With such components, users will be able to build cloud infrastructure diagrams that capture their key services. The visual designer allows users to capture data from their cloud infrastructures so they can produce live diagrams that show up-to-date information and data. All they need to do is to connect their existing Amazon cloud service account to the solution. Once they are able to integrate their AWS account, they can then import data from their cloud infrastructure. The live components in their diagram can show information such as configuration and cost. Also, through the aid of tags, they can switch between their diagram and the AWS Web Console. Another great feature of the tool is that it ensures that data are always synchronized. This means that whatever data they imported into the solution is synchronized with the data they have within their cloud infrastructure. Thus, when changes are made to the data in the actual cloud environment, the solution will automatically update the diagram and reflect the changes. In addition, the live components in the diagram will always remain connected to each other. Cloudcraft can also generate valuable information about the drawn cloud infrastructure along with the data imported into the tool. It can produce status information related to an infrastructure component as well as display information on the health of the entire cloud infrastructure. These pieces of information are very useful when users are conducting an inventory of their AWS resources and services. The diagramming solution delivers collaboration features. For example, users can directly attach documents to any component within the diagram. This makes it easy for them to make their diagrams more realistic and substantiated. They can also make edits wherein team members can make changes to the diagrams online. The solution offers export capabilities, enabling users to share diagrams with their colleagues or present them during meetings and discussions. If they want to export their diagrams as Word documents or publish them on wikis, Cloudcraft makes that possible as well. If you are interested in Cloudcraft it may also be sensible to check out other subcategories of Best Cloud Management Software listed in our base of SaaS software reviews. It's important to realize that virtually no app in the Cloud Management Software category is an ideal solution able to fulfill all the goals of all business types, sizes and industries. It may be a good idea to read a few Cloudcraft reviews first as certain services can dominate just in a very narrow group of applications or be created with a very specific type of industry in mind. Others can function with an idea of being simple and intuitive and as a result lack complex functions desired by more experienced users. You can also come across apps that cater to a wide group of customers and offer a powerful feature toolbox, but that frequently comes at a more expensive cost of such a service. Be certain that you're aware of your requirements so that you buy a solution that offers specifically the functionalities you look for. How Much Does Cloudcraft Cost? For more information about Cloudcraft’s enterprise pricing plan, please contact the vendor and ask for a personalized quote. We realize that when you make a decision to buy Cloud Management Software it’s important not only to see how experts evaluate it in their reviews, but also to find out if the real people and companies that buy it are actually satisfied with the product. That’s why we’ve created our behavior-based Customer Satisfaction Algorithm™ that gathers customer reviews, comments and Cloudcraft reviews across a wide range of social media sites. The data is then presented in an easy to digest form showing how many people had positive and negative experience with Cloudcraft. With that information at hand you should be equipped to make an informed buying decision that you won’t regret. What are Cloudcraft pricing details? What integrations are available for Cloudcraft? If you need more information about Cloudcraft or you simply have a question let us know what you need and we’ll forward your request directly to the vendor.